In panels like the Kill la Kill panel, we mention "otogizoshi" - fairy tales and fantastical stories of the Muromachi period of Japanese history and onward. Stories of the mysterious, just as often as they are stories of glory or of the ridiculous. These stories may have originated in the Muromachi period (roughly, 1337-1573 CE) but inspire more modern stories also. My favorite story involves Tamamo-no-mae, the dangerous fox. Of course, there are differences in versions, but I will tell you some of her story. It is said that during the reign of Cloistered Emperor Toba, a maidservant became popular at the Cloistered Emperor's court. This girl always smelled wonderful, and her clothes were always perfectly beautiful and arranged; even on the most sweltering of days or rigorous of events. She seemed about twenty, yet there was nothing she did not know: a question or riddle would be posed to her, and she would answer in plain words, making even the most difficult teachings of Buddha or the knowledge of great scholars from overseas simple to understand. This baffled the court, because no one knew who she was; yet they adored her. The Cloistered Emperor became infatuated with her (as did most of the court), but so greatly was he charmed, that he cherished her almost as if she were his empress. Drawn to her beauty and knowledge, he exchanged deep vows of passion and affection with her. Certainly, any fear that he may have had melted, like the morning sun makes even the darkest of shadows fade away. But suddenly, he became very ill and was confined to his rooms. The court physicians came, and eventually decided: this was the work of evil, this was not something easily cured with their herbs or skill. The diviner Abe-no-Yasunori was consulted, who declared: something big would happen, the emperor must pray immediately for salvation. This worked the court up into a frenzy, and monks from all over the land were brought to pray and chant at all hours, day and night. But the Cloistered Emperor's condition did not improve, and as the days passed, the court despaired. The monks left to return to their duties at temples and the provinces. Abe-no-Yasunori was consulted again. This time, he hesitated to speak. But the Cloistered Emperor nearly begged him to save his court, and so he spoke. "It is the girl you call Tamamo-no-mae. She is a fox, and she is a thousand years old. Murder and chaos follow her. Certainly, she is doing this, so she can rule these lands after your death." There are different versions of this story, but most of them concentrate on what happens after Tamamo-no-mae is revealed as a fox. She flees the court, and the bravest warriors in the court resolve to hunt her. Some stories say they succeed, and the corpse of the fox produces wonderful and mysterious powers and treasures. Some stories say Tamamo-no-mae struck a bargain; in return for the warriors sparing her life, she becomes trapped in a form of a rock for awhile - her evil is driven out, and instead the remainder of her soul becomes a ghost haunting the rock. This rock is known as Sessho-seki, the Killing Stone, for around it nothing grows. Nothing comes near. Nothing lives. Eventually, it's said, a priest called Genno came by and found out about the ghost of the fox. He spoke with it, performed rituals, and spoke of enlightenment; the ghost is persuaded to leave the stone be. You can still visit the Sessho-seki, though. It's in Nasu, in Tochigi prefecture. 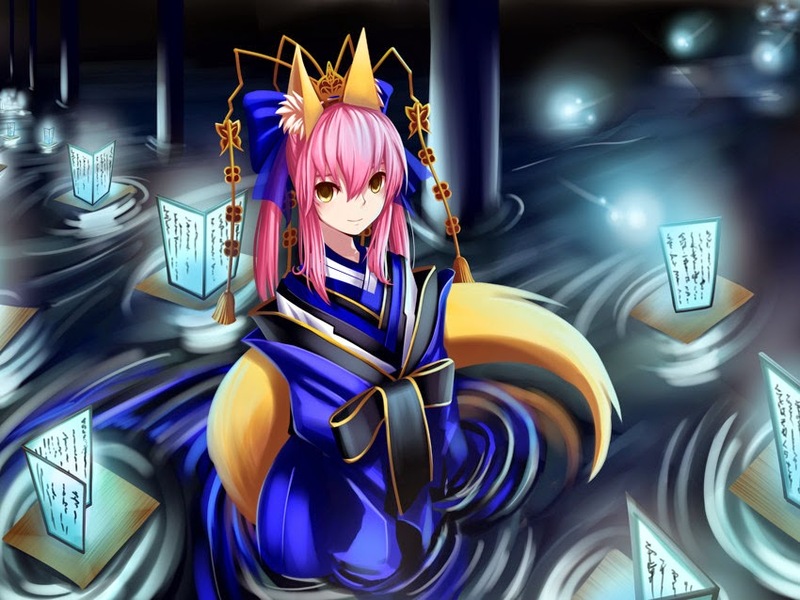 In Chinese lore, Daji - who was said to be possessed by an evil fox-spirit, and who created horrifying forms of torture - might be Tamamo-no-Mae; some of the Japanese stories, after all, say that Tamamo-no-Mae wandered from India to China and eventually to Japan. Where she walked, kingdoms fell into ruin. Yet, some stories and interpretations see her as a unwitting sort of heroine; a woman who threatened the existing order with her knowledge, and usually pushed already-falling kingdoms more into ruin to hasten any improvements. So who knows where - or what - Tamamo-no-mae really is.